Super Hero Boy: Just four more days till my baby gets to sleep in his new Contours Classique Bassient! Just four more days till my baby gets to sleep in his new Contours Classique Bassient! It's the wee hours of the morning on Valentines Day and of course I can't sleep. I've actually not been able to sleep well the last two or three weeks but it seems the closer we get to the big day the harder it's getting. Actually ironically enough I said the one day I DIDN'T want to have this baby was on Valentines Day as well I think its wouldn't be as fun to share a birthday with a holiday... and I've not had any really good contractions in days and tada sometime after midnight they started. We've had many nights like that, so I'm not getting excited but it does have my looking at my baby's new bed. 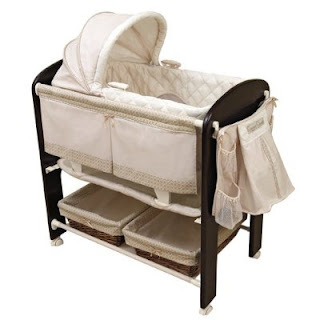 When Connor was born I looked everywhere for a decent bassinet but I've just never been the type to like those white frilly looking bassinets that are so common. Not to mention so many of them take up so much floor space and at the time we had a very small bedroom with a king sized bed in it, and seeing as I breast feed I really wanted to have my bassinet as close to me as possible when I sleep. I ended up getting him a fairly unfrilly bassinet second hand and though it defently did the job I was never overly excited about how it looks and even more so it took up quite a bit of floor space so once I had it against the bed it pretty much took up the entire space between the bed and the wall. So I knew this time around I wanted to get the baby something new and I really wanted a wooden more modern looking bassinet but on our budget most of the luxury bassinets were just out of the question. Kolcraft totally came through for me by offering us a chance to review one of their bassinets for the new baby and when I saw the Contours Classique I knew I had found the perfect solution. Actually I couldn't be more thrilled with our bassinet choice. Though the Contours Classique is not a solid wood bassinet it does appear to be at first glance. The front and back of the bassinet are are a really pretty dark wood and this bassinet is loaded with features you'll just love. Though I have to say the first thing that attracted me to this bassinet was the looks, I'm just thrilled with the features it offers as well! It has a really small footprint compared to all of the other bassinets I've seen and though we have a bigger bedroom now than we had when Connor was an infant space is still a big priority. We only have two bedrooms in this house and though the boys will eventually share a bedroom I plan on keeping the baby in the bassinet in our bedroom until he outgrows it and the last thing I want to do is tromp into Connor's room late at night to grab wipes or diapers and risk waking him if if we need something. So I pretty much need to keep a supply of everything we need in my bedroom for late night changes and just purely for convenience. The Contours Classique bassinet is in itself a bassinet (which is removeable so you can take it with you room to room or even on overnight trips), changing table, diaper caddy, and even offers generous storage. The front of the bassinet has a really handy removable diaper stacker which will allow you to store everything from creams to diapers to even small toys. I've pretty much put everything we need to accomplish diaper changes as well as some other supplies in the front at hands reach. Directly under the bassinet is a diaper changing table that can be installed once the baby is too big for the bassinet (you must remove the bassinet to use the changing table) so the bassinet doubles as a changing table far after you've outgrown it as a bed! My favorite part however are the really great baskets that are included as well that also fit up under the bassinet which I'm storing extra onsies, burp cloths, small toys, an extra set of sheets, blankets, and wipes. Basically anything I could possibly need in the middle of the night is all contained in my bassinet so there is never a reason to risk waking up Connor while I search for something in his room.The bassinet is also on wheels so though I have it pushed closer to the wall so I can get in and out of bed easily right now once the baby is here and nursing I can just easily roll it over to me at night so I have easy access to baby for night time feedings. I also installed a crib night light on the side (not included with the bassinet) so I can just turn on the night light and not wake up Chris either. Let's just say I'm overly excited to start using it! One thing I have to mention I put this bassinet together almost completely by myself, hugely pregnant, and with limited mobility as once I sit down on the floor its really hard for me to get back up. I actually completed it while watching a movie with Chris and really the only time I needed assistance was when we put the tubes that connect the front and back together on as it's far easier to screw them in if one person holds them while the other person screws. Otherwise the directions and parts were all VERY easy to work with and super clear which is always a huge plus as I've found that crib directions especially can be hugely frustrating. Check out more pictures and information on the Kolcraft Contours Classique on the Kolcraft website. You can also purchase your own on Amazon! I'll try to update this review later with a picture of the new little person sleeping in his bed here shortly as well.